Hi friends! Long time, no see. I’ve been well…busy. But NEVER too busy for a terrific friend and all around awesome girl. Angelica is stepping down from her post as Peachy Keen Goddess and pursuing new opportunities. LOVE that! It’s all about taking risks and pushing your boundaries in life, right? I created this card for her just to send her some love. I know she will do awesome with anything she puts her heart into and I just wish her the best 🙂 Love ya girlie! 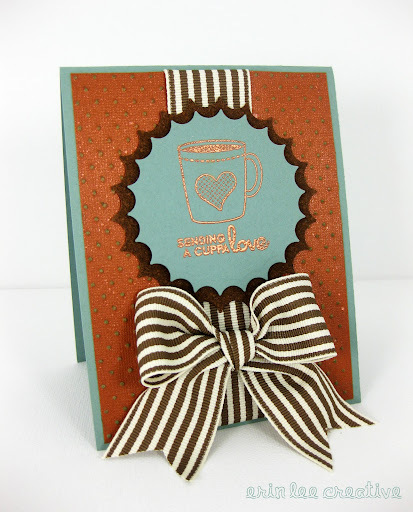 For this card, I used her company’s (Market Street Stamps) Daily Grind set. Papertrey Ink Hawaiian Shores paper, Tim Holtz kraft core copper paper, swiss dots embossing folder, copper embossing powder, Stampin Up ribbon and Spellbinders Nestabilities. Onto the next stop on the hop….Samantha! Have fun!